Investigators who are working a double-shooting in River North early Saturday that left an off-duty Chicago police officer dead and his friend critically wounded are considering the possibility that the men were misidentified by the killer, according to a CPD source. While stressing that the investigation is on-going, the source said that police are looking at possible connections to an incident one hour before the shooting at the former Rock’n’Roll McDonald’s. Just before 2:30 a.m., police responded to the restaurant at 600 North Clark Street after witnesses reported “10 Hispanic gang members on a party bus” beating up two black men. 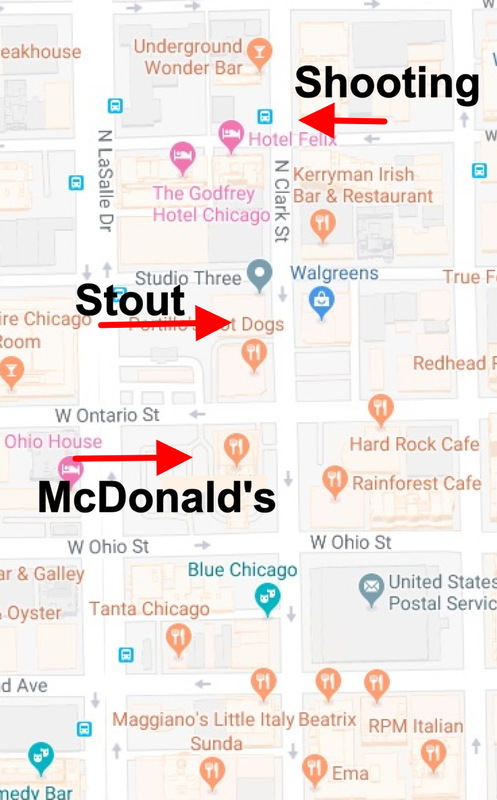 Almost exactly an hour later, 23-year-old off-duty Chicago Police Officer John P. Rivera, his girlfriend, another off-duty officer, and a friend of Rivera’s left Stout Barrel House bar at 632 North Clark Street for Rivera’s car, which was parked in the 700 block of North Clark. Moments after the four were seated in Rivera’s car, two men approached the vehicle, and one opened fire on the driver’s side of the vehicle, killing Rivera and critically wounding his friend in the rear passenger seat, according to a source familiar with the investigation. The entire incident was captured on at least one city POD camera. According to an unofficial summary of events shared with CWBChicago, the primary offenders may have remained in the area after the McDonald's incident to search for people they believed were involved in the attack. The offenders were reportedly directed to Rivera's car by a vagrant who was walking in the area. Police took a person of interest into custody near the shooting scene about an hour after the incident. CPD Deputy Supt. Anthony Riccio said on Saturday that the individual in custody is not the shooter. The gunman and his companion were both believed to be at-large as of midday Saturday. Investigators are also considering the possibility that the offenders were in the area to conduct robberies, but CPD’s chief spokesperson, Anthony Guglielmi, said at midday Saturday that surveillance cameras in the area had captured no images of the two suspects having any sort of “encounter” with Rivera’s party before the shooting. The men made no demands for valuables or the victim's vehicle before shooting began, Riccio said.